A few weeks ago, I went for a jog around South Beach. I ran up past Ocean Drive, onto the 23rd street wooden boardwalk and looped around rollerbladers along Collins Avenue. I was plugged into my distance tracking app to keep tabs on mileage. But that also meant I was tuned out of my surroundings. Later this year, mile-marker signs will help me track how far I’ve gone, minus the gadgets. It’s a simple intervention, but one that’ll nonetheless change the experience of hundreds of exercise-goers and pedestrians who use that route every day. It started with an idea by someone who knew their community well and had a concrete way to improve it. That’s the goal of The Miami Foundation’s Public Space Challenge, which launches today – to help locals make sometimes small yet meaningful differences on the place they live. Now in its sixth year, the Challenge will again invest up to $305,000 in your ideas for improving Greater Miami’s parks, plazas and local gathering places. Target will also contribute funding for winning ideas that encourage healthy eating and active play. Through May 3rd, you can submit your ideas at publicspacechallenge.org. Since starting in 2013, the Challenge has supported almost 100 winners, creating a network of public space champions our city needs. Take Wendy Caraballo, a 2017 winner. 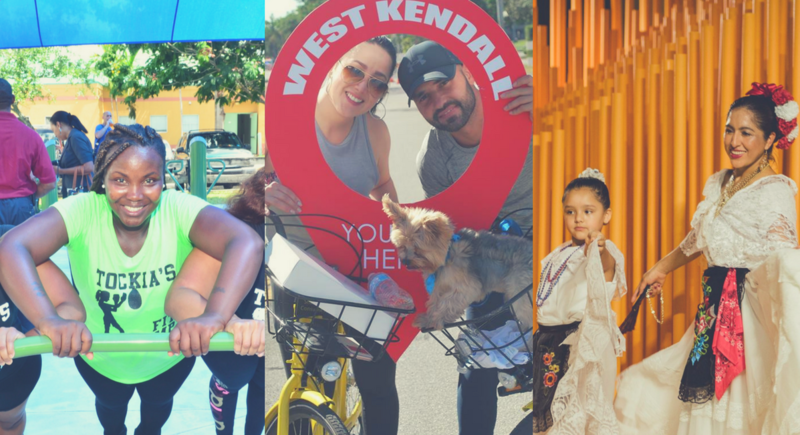 She connected with Juan David Rey, the 2016 winner behind the West End Concert Series, and brought Ciclovia to West Kendall in February. Wendy turned a busy road, usually populated with cars traveling in speeds up to 50 mph, into a pedestrian- and cyclist-only thoroughfare. For those few hours, hundreds of people had the chance to cycle and connect with one another without having to worry about traffic. Many other winners have gotten to know one another, swap ideas and even join with us to advocate for more funding for parks county-wide. In 2017, we also asked folks to connect their ideas to the Miami-Dade County Open Space Master Plan, which has the vision of getting a great public space within walking distance of every Miamian. You don’t need to be an expert in parks or public spaces to apply, I certainly wasn’t when I took on my role with the Public Space Challenge two years ago. Since then, idea submitters and winners have helped reshape my thinking of public spaces beyond only green parks to include streets, canals and even bus stops. I’ve seen how public spaces can bring all kinds of social benefits. Parks and trails provide venues for community events and offer transit alternatives. New facilities create safe spaces and programming that can help address violence. Property values increase in surrounding neighborhoods. We can also design spaces that allow us to live with water and reduce flood risk. The best part about the Challenge is that it’s open to everyone in Miami-Dade County. You can apply as an individual, like Ileana Collazo, who brought art to her Little Havana neighborhood, with a group like UM School of Architecture students, who brought an outdoor stage to The Underline in Brickell during Art Basel, or on behalf of a business, nonprofit or community-based organization such as Gwen Cherry Park Foundation, who created a shaded covering for an outdoor fitness zone. If you see an opportunity and have a desire to seize it, we’ll help you with the rest from getting your idea on paper to carrying out your project. We’ll host a webinar and a series of public workshops together with Urban Impact Lab throughout the county during the Challenge. You can see the list below and RSVP here. – Visit publicspacechallenge.org. Click the “Add an Idea” button in the bottom left-hand corner. A red pin and a submission form will pop up; move the map and zoom in to where you’d like the pin to land. – Hit “Submit” by May 3rd, and encourage your friends and social networks to “Like” and “Comment” on your idea. Jordan De Leon is programs associate at The Miami Foundation. I just found out about this challenge. Hopefully next year we can submit an idea. The Brownsville’s “Pillars of History” a Place to Remember public space challenge proposal is a powerful, yet beautiful expression of a neighborhood with such great heritage and strength. Despite the white opposition in the late 1940’s after WWII, black residents “UNIFIED” their efforts toward the American dream of ownership of the land granted by W.L. Brown. Later the Brownsville neighbors created the Brownsville Improvement Association for what was described a “Model City” with the development of neighborhood community projects. Today, Brownsville is a neighborhood of great Miami black heritage and inclusivity to all who might otherwise be marginalized or excluded. I REALLY LOVE THE SPACE CHALLENGE “BROWNSVILLE UNITY BLVD” PAINTING SKETCH PROPOSAL ON THE METRORAIL PILLARS!! My late father would be so proud. THANKS ISABELLA FOR SUCH AN AWESOME IDEA!! !